So I was wrong. Like that surprises you? Congrats to Marsh Madness! and blackcat, who took number one and two in the pool. And Bucket Brigade, aka Speak(er), who gets the coveted Cubs prize. The NYT reports that Obama has released his final four bracket (can Hillary's taxes be far behind?). In a typically Obamian bold move, he put Pitt in the Final Four. Nice. No, I don't mean THAT Holy Week; it's tourney time! My pool is on again this year; drop me an email if you're interested in joining us. As for advice, well, I have two pieces of it: watch out for Wisconsin, and don't put all your eggs in the Kansas basket. I've said it before, and I'll say it again: Bill Self cannot coach in the tournament. Beyond that, you're on your own. Good luck! Farewell, my up-until-last-night-awesome tourney pool! Fast break dogs always beat big man dogs (hence, SIU Salukis beat Albany Great Danes). Dog pets always beat animals, even if those animals are dogs (e.g., Great Danes beat Nevada Wolfpack). In a matchup with no dogs of any kind, animals beat non-animals as well as animals they could legitimately eat (hence, Gators beat Wildcats). Wealthier or stronger people mascots beat other people teams (e.g., Vandy Commodores beat GW Colonials). The category of mythical mascots is tricky (e.g., Va Tech Hokies, Georgetown Hoyas). Hokies and Hoyas aren't anything. We decided that schools with no mascots (e.g., Illini!) lose to teams with mythical mascots (e.g., Hokies) but that Hoyas are a special kind of mythical mascot because they have adopted a dog image; hence, they are quasi-bulldogs and go far in the tournament. (But, of course, they lose to the Great Danes because the Great Danes embrace their dogness and don't have to make up silly names like "Hoya"). Next year, a cat bracket. We promise. 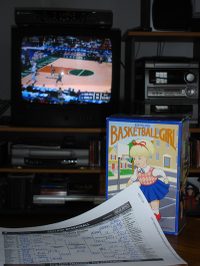 It's hard to admit, but Basketball Girl really lost interest in the Final Four this year. She was in full-on fan mode all the way through the Sweet 16, even though her beloved Illini tanked well before that. The Bradley Braves were a bright spot, and that George Mason stuff sure was fun. But the Final Four games themselves were completely dull blowouts. BO-RING. Basketball Girl missed the entire first half of the final game last night because she had to watch Jack shoot the bad guys on "24." During the second half she finished reading the leftovers of her Sunday New York Times and dozed off on the couch. Not even an occasional glimpse of Clark Kellogg in glasses (glasses!) 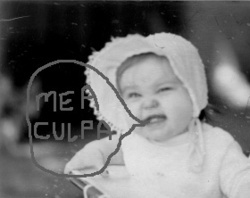 could rouse her. She was done. Basketball's over kids, it's time to move on. Of course, what we've moved on to, at least if you are my beloved, is baseball season. Cubs season, to be exact. God help me. Congrats to Lu Ann "Green St. Hoops" Finnegan and Scott "Turn and Cough" Springman, who took the top two spots in my annual pool. They will receive Major Awards. And, don't forget Mary and Thomas Maruska, those Flying Mapuskis, who finished last and thus laid claim to the coveted Cubs Prize. In a cruel twist of fate, my beloved and I found ourselves scheduled to fly to Atlanta during last night’s Illinois vs. Washington basketball game. But we consoled ourselves that we were flying on AirTran, a Truly Civilized Airline that offers free XM radio to all passengers. At least we’d be able to listen to the game on the radio. Nope. Apparently XM has contracts with every network *but* CBS. Trapped at 37,000 feet, we had to rely instead on score updates from ESPN, Sporting News Radio, and Fox. These outlets were completely and utterly unreliable, which made me totally insane. ESPN seems to believe that Duke is the only team in the tournament. I must have heard Coach K's post game comments about their *expected* second-round victory replayed at least six times, no exaggeration. Meanwhile, on Fox, news about NASCAR was privileged over updates on NCAA games in progress; another reason to hate those pesky red staters and their evil network. Finally, just when it seemed that these so-called "news" outlets might actually give us an Illinois score, the flight attendants would interrupt on the intercom with blather about safety, oxygen masks, and water landings and drown everything out. Didn’t they understand that I was going to die if I didn’t get an Illinois score and get it now? My safety and perhaps that of those around me was in jeopardy. Of course, at the few moments when we actually did get updates on the Illinois game, they produced nothing but more anxiety and dread: the great comeback from 14 points down, then the seemingly comfortable 10 point lead followed by the painful 3-point loss. All told, I was pretty bummed when we got off the plane. But, as Scarlett O’Hara famously said, “Tomorrow is another day.” Today the Bradley Braves fought to an unexpected Sweet 16 berth. Good news for my beloved (it’s his alma mater) and for Illinois folks looking for a home team to root for. 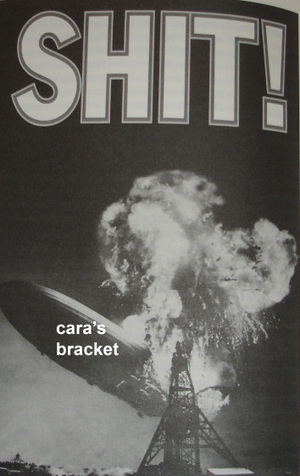 And besides, the Illini’s loss didn’t bust my bracket. And really, isn’t that the most important thing? The pool's posted and the games have started. Ahhhhhhhhhhhhhhhh. All is right with the world.I hemmed and hawed a lot about it last night, writing things in, then erasing them, then rewriting what had been there because every time I change something it turns out that I shouldn't have. Brackets are HARD. They were much easier when I didn't know anything about basketball. I am not really much of a pool veteran. 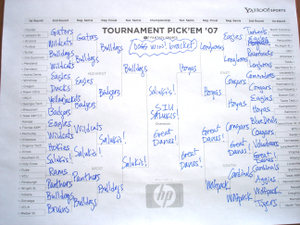 I filled out my first official bracket in 1997 for a friend's office pool. Miraculously, I tied for second that year. Credit my hometown, feel-good pick of the Minnesota Gophers to get to the Final Four. Sure, all the sports veterans laughed, until that unknown snooty chick grad student from Northwestern beat nearly all of them. The next year, I was more motivated but also not very informed and I won the whole thing. I've been in a more or less steady decline ever since. Ironically, as my knowledge of college basketball and "bracketology" has increased my success has decreased. There's a lesson in that somewhere. This year I'm focusing on, as Will Ferrell doing George Bush likes to call it, "STRATEGERY." Sure, I still applied some rules (no 16's ever beaten a 1, always pick a 5/12 upset, etc.). But after cruising the web and this week's newspaper previews I decided that the best strategy is to make oddball choices that *could* happen. Ohio State over Villanova to reach the Final Four? It *could* happen.